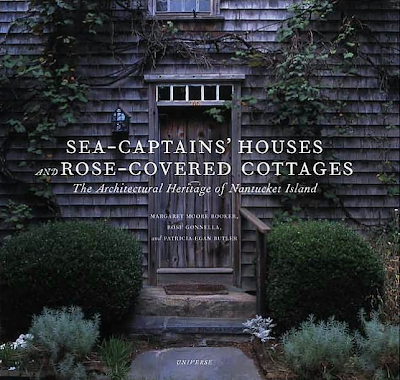 I’ve always adored the cover of this book an Nantucket’s architecture- my dad has had it on his coffee table for years! 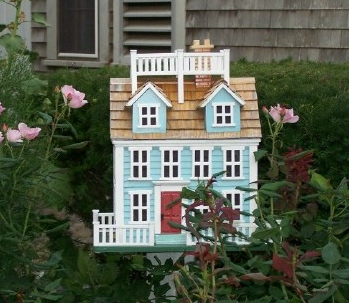 Even the birdhouses are architectural gems. And probably cost more than my condo. Just great memories came back upon seeing the photos. 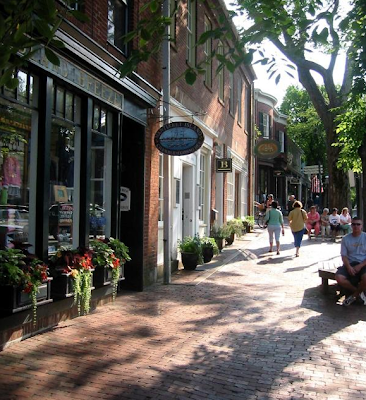 While not Nantucket, a more afforable option is Chatham (my old stomping grounds). 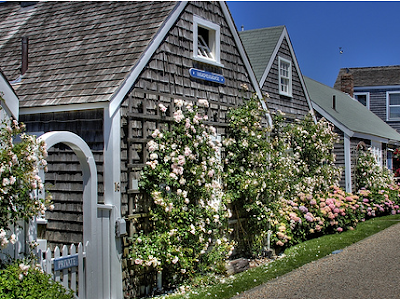 Clearly the quaintest of the Cape Cod villages with some of the best shopping, it is a great weekend trip. 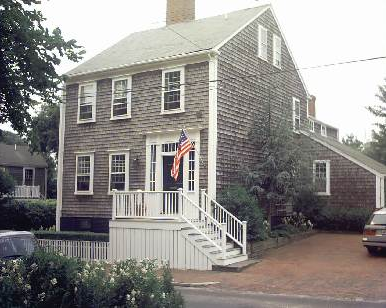 I used to work at the Chatham Bars Inn during the summer. Even if the room rates’s price tag is a bit pricey during the peak season, the restaurants, gardens, and new spa are open to all. 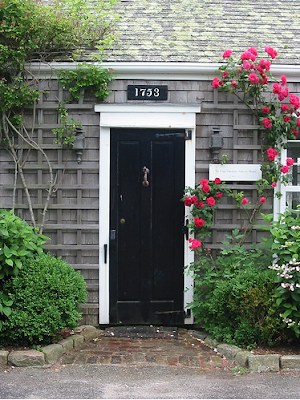 I have nothing but great memories of my trip to Nantucket, too. I keep swearing to go back, but haven’t yet made it. Perhaps we’ll throw it in the mix of places to consider for my husband’s and my anniversary. 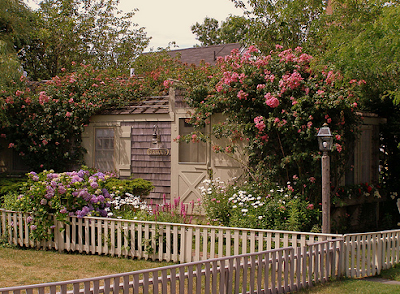 I’d love a rose covered shack of my own to escape to. Wow, I love all these images. 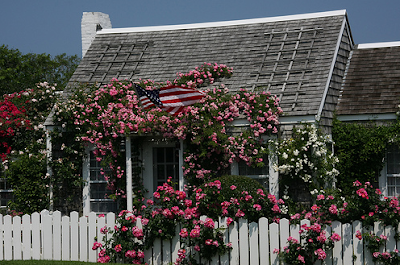 These little rose covered cottages are just amazing. 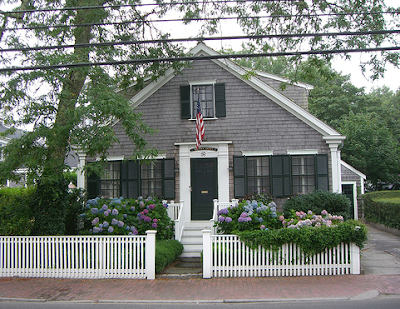 Now I can start day-dreaming and wishing I wasn’t in my cubicle but sipping organic lemonade on the porch of one of those Nantucket cottages. hahaha love the title of this post. Thank you so much for your BLOG. I’ve really been enjoying it! I’m a southern California Interior Designer and store owner . . . Who is trying to bring the East Coast to the West Coast. Having a great time doing it! I enjoy your style very much! Thanks! Please keep up the posts . . . This Blog hits home . . . 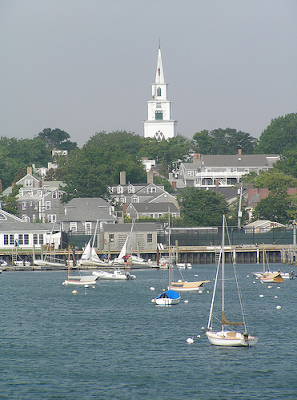 I too worked a summer on the Cape at CBI, my brother went to Boston College, my cousins live in Greenwich, aunt and uncle in marblehead and I went to Nantucket every free moment I got. 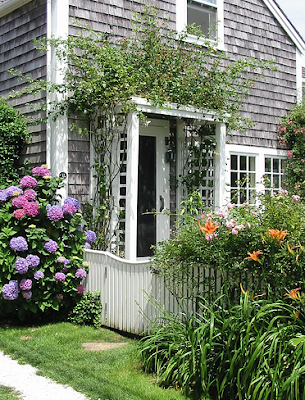 The cottages are to die for. 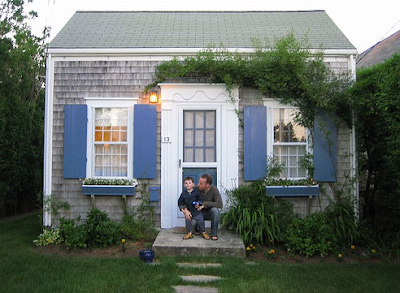 When and if we can sell our condo I will be building a nantucket cottage! One day . . . Have to wait till the houseing market here in California gets a little better! 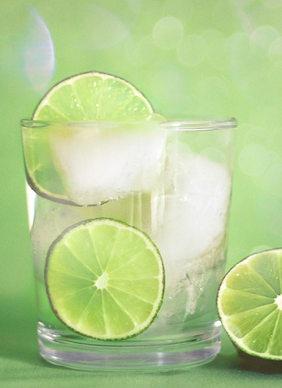 Thanks again great BLOG today! 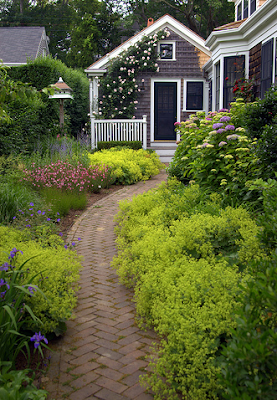 I’m actually creating something similar in my backyard, since my husband and I don’t have time to get away much…although I’ve called it my little chateau. 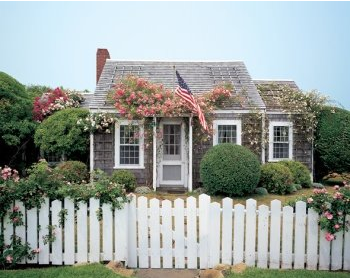 Going to use these photos as inspiration to paint the exterior of my little nest. Thanks! This sounds so, so wonderful. I’ve never been but would love to go. Beautiful images. I am accepting your lovely invitation! What a charming post about a charming place. Thanks for taking me on a wonderful tour. I love the added suggestions for attire & dining. You are a great little travel agent my dear! So pretty! It’s not exactly the same but I just got back from Cannon Beach, OR and they have a few little (and not so little) beach houses that are also so cute. I adore the beach, especially at sunset. Thanks for the lovely pictures this morning! Amazing! 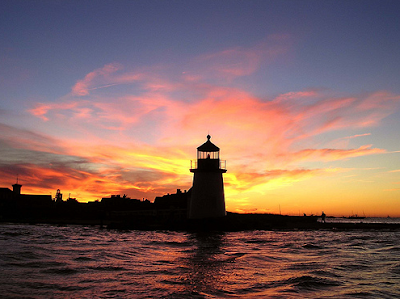 My husband and I had a wedding in Hyannis last summer & stayed in Chatham. Everything up there is so sweet, cozy & laid back cool. 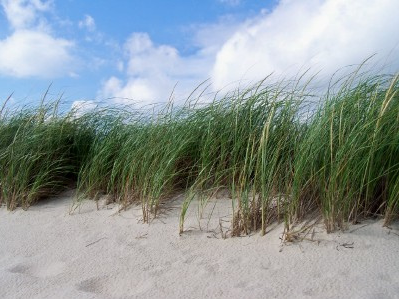 I long for that long strip of beach to walk on right now! 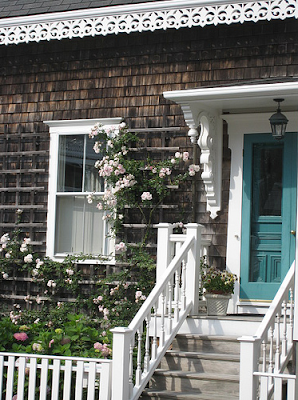 Well, Erin, consider this an invitation to stay in our rose covered cottage in Nantucket any time you would like! 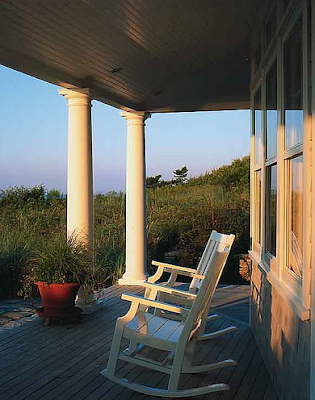 It is located right in town on the ocean … I know you would love and appreciate the interiors. 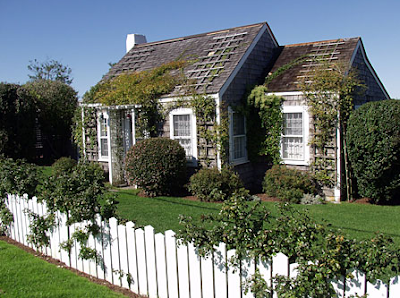 You could even blog on the cottage all while sitting on the front lawn watching the sail boats come in. what a great collection of wares… good eye. the insipiration’s not too bad either. Oh wow. This was such an escape. And you even gave us a pretty outfit to see! Oh my gosh…so sweet! And really, what else do you need? Adorable.